Since reading Brandon Sanderson’s Mistborn trilogy I’ve paid close attention to his career. The Mistborn books were uneven, but their particular strength, the way revelations about the world fed back into the narrative, was one that really appealed to me. Since then Sanderson has mostly been sucked into working on big series, from a trilogy to finish Jordan’s Wheel of Time to a ten book series (sigh) of his own. I’m not as resistant to reading unfinished series as I used to be (I never read Wheel of Time for that reason, or Martin’s Song of Ice and Fire) but I still prefer complete stories. So I was very happy when Sanderson, who apart from any other virtues may be the most prolific author working today, somehow squeezed a standalone novel, Warbreaker, into his schedule. First and foremost, Warbreaker shares the rigourous approach to its backstory that I was so impressed by in the Mistborn books. The magic system is laid out clearly and functions according to rules, but the characters don’t know all of them. In this respect, Sanderson’s fantasies have a very modern attitude, for some (though not all, or even most) of his characters take a scientific approach to magic, studying it to unlock the mechanisms by which it works. Throughout the novel the reader (along with some characters) learns more about the magic system, and each new revelation fits in marvelously both with what had come before as well as the dramatic demands of the narrative. Another trait, less positive in my view, it shares with Mistborn is a capacity for introducing interesting sociological structures but not following through on them. Most of Warbreaker takes place in a city ruled by a council of “gods” who turn out to be humans (sort of) with special powers. Some characters like this approach to government and others despise it, but while they each get chances to (briefly) state their reasoning, the question is never explored in depth. Both here and in Mistborn, the narrative ultimately takes what I would call a pre-modern view of governance: different nations have different political systems, but what matters is the people in charge. If these are good people, then all will be well. If they are bad people, then the nation will decline. The ultimate goal of the characters, then, is to replace the bad people in charge with good people, and if changing the system of governance is necessary to make this happen then so be it, but otherwise sticking to tradition is probably best. At least in Mistborn this was fleshed out a little bit by the fact that once in power, the good people found it was harder than they expected to achieve good outcomes, but Warbreaker doesn’t even resolve its most basic question: is a monarchy preferable to a pseudo-theocracy? Finally, I should mention that I found the characters in Warbreaker to be considerably more appealing than those in Mistborn, but this was counterbalanced somewhat by the way the final third of the book seemed rushed. There are two characters in particular with concealed histories who suffer from the inadequate amount of time between the revelation of who they really are and the conclusion of the book. As a semi-twist revelation, it’s fine, but as is so often the case with such maneuvers, in concealing the twist the narrative also obscures their true motivations and feelings, and they end up being ciphers. In any case, although Sanderson had elegant resolutions to the stories of the many viewpoint characters, it felt like none of them quite got the time they deserved. I’m not sure if this is a genuine failing in the story or if my “story sense” is simply calibrated for trilogies due to how common they are in fantasy, but I can only report the impression. 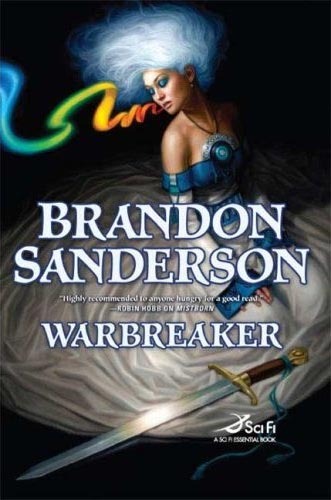 I can’t help but wonder if another revision might have improved the final result had Sanderson not been so busy with other matters, but Warbreaker is still a very enjoyable book and recommended for fantasy readers interested in rigorous magic systems and careful plotting.